When cases of Ebola were on the rise, many people stayed away from Sierra Leone. They were afraid of getting infected. However, in 2014, ONE Champion Asefon Babatunde volunteered to be part of the Ebola rescue mission team. Many have asked him why he took such a risk, especially when he had only recently got married. This week we had the opportunity to talk to him about this brave choice, his experiences in Sierra Leone and his thoughts on healthcare systems and crisis response in Africa. Hey, Asefon! 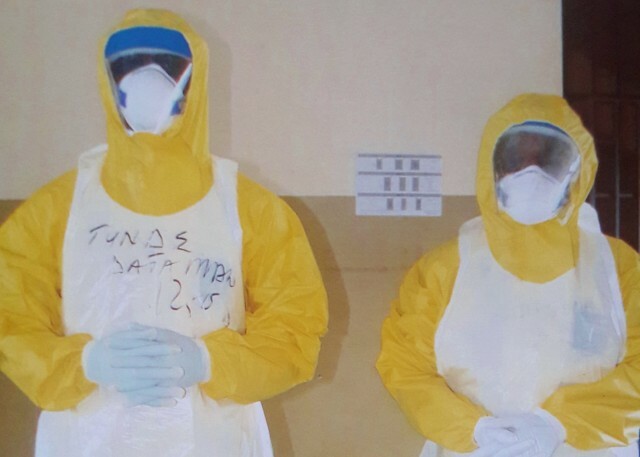 Why did you decide to go to Sierra Leone during the Ebola outbreak? The decision for me to go to Sierra Leone for the Ebola mission was purely on humanitarian grounds. When I heard the call for experienced personnel, I stepped forward, ready to serve. Though I had been married for only a week, I felt moved to show compassion to my fellow Africans. This mission was with the African Union and though they told us that we were going to the ‘hot-spot’, I knew it was what I was meant to do. Asefon (left) and a fellow rescue mission team member, Sierra Leone, 2014. What were your roles and responsibilities in Sierra Leone? I served as Data Management Expert trained by the Centre for Disease Control (CDC). My daily role included interacting with non-governmental organisations such as the CDC, World Health Oganisation (WHO), DFID, and the United Nations to give them feedback on what was happening on the ground. We were responsible for collecting and analysing data in order to make informed decisions. We would respond to alerts of identified Ebola cases in the community and transport them to nearby treatment centres. Were there any times that you felt like just throwing in the towel and going back home? Oh yes. The worst time was when one of the volunteers got infected. I was afraid. The cases of new infections were increasing on a daily basis. We were advised to follow the Standard Operation Procedures to avoid infection. This was a difficult exercise. However, I kept going with the assurance that I was contributing to saving lives. What were some of the key challenges you observed that were worsening the problem? There was limited access to health facilities and therefore it fell to us to educate the community and get messages across. What improvements do you think need to be made in the health system to ensure that they are better prepared for any other outbreaks? More research needs to be conducted in order to understand such diseases and methods of prevention. Community awareness raising must be made a priority – not just formal education, but informal health education as well. There is also a need to invest more in infrastructure and train more health care personnel. I believe they were unable to contain the outbreak early on because of a combination of all the factors I have shared. Asefon Babatunde is a ONE Champion based in Lagos, Nigeria. He is currently pursuing his MSc at Ekiti State University. He expresses his heartfelt appreciation to the Nigeria team that helped in containing Ebola in Africa led by Prof. Abdulsalami Nasadi and Dr. Joshus Obasanya of the Federal Ministry of Health in Nigeria. Join Asefon and others like him who want to make the world a better place and end extreme poverty. Join ONE now!